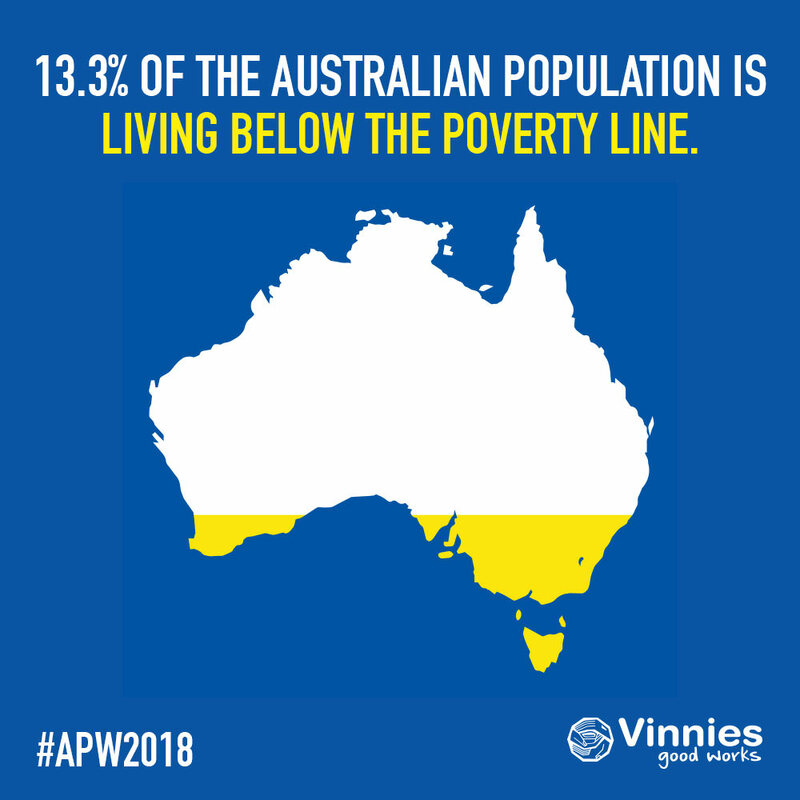 At Vinnies we believe that empowering people, not blaming them, is the answer to combating the poverty that affects one in eight Australians. 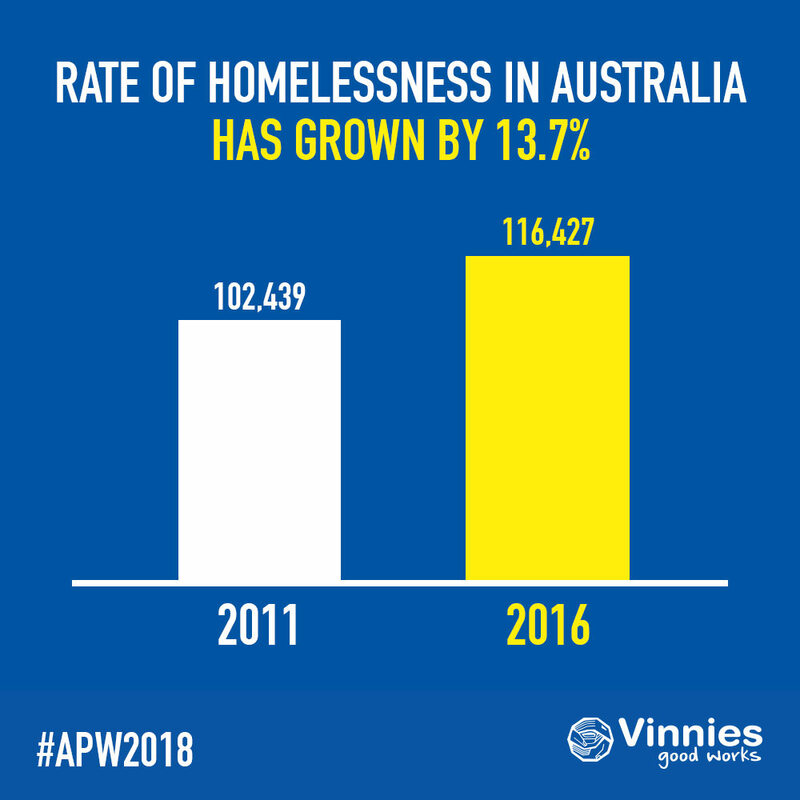 Vinnies members, volunteers and employees assist over 1.8 million Australians each year and works directly with people experiencing poverty and homelessness . We also advocate for the rights of marginalised groups in the community and view Anti-Poverty Week as an opportunity to spread greater awareness of marginalisation in Australia. 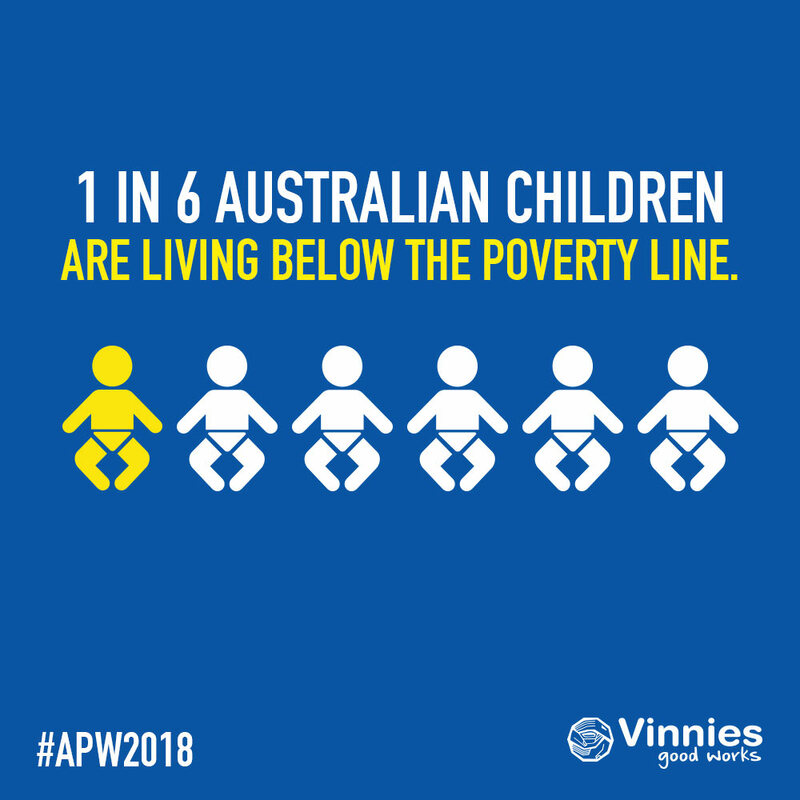 Anti-Poverty Week is being held from Sunday, 14 October to Saturday 20 October 2018, and focuses on poverty across the world, including Australia . 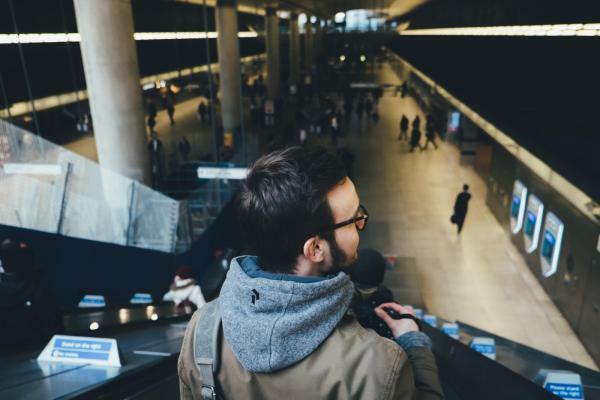 In 2014 it was recorded that 2.9 million Australians are living below the poverty line. Almost 35% of people experiencing poverty are employed or past retirement age. 12.3% of people with a disability are experiencing poverty. More than 730,000 children in Australia living in poverty. 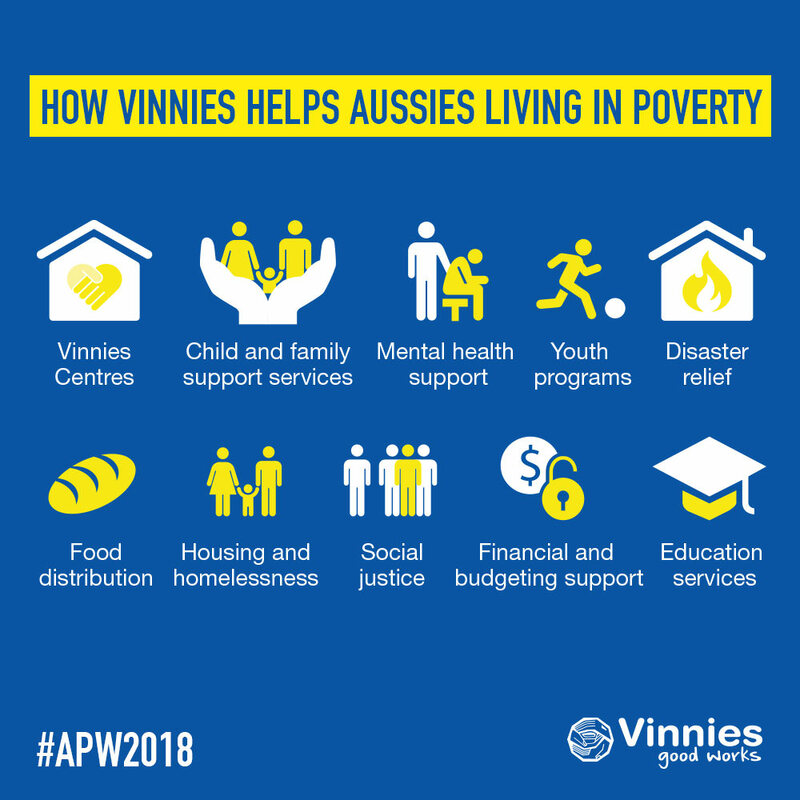 Vinnies has several events taking place in communities across Australia during Anti-Poverty Week. These events range from forums in the capital cities to sausage sizzles in regional centres. For a full list of events taking place, visit the official website and click on ‘Calendar of Events 2018’. You can help fight poverty and hardship! Not sure how you can make a difference and help people living below the poverty line? Visit our Find Help page if you or somebody you know needs assistance. Visit the Low-Income Support page to learn more about our advocacy and services. You can volunteer for Vinnies frontline services, visit Become a Volunteer . If you don't have time to volunteer you can make a donation to ensure our volunteers have the life changing resources they need. 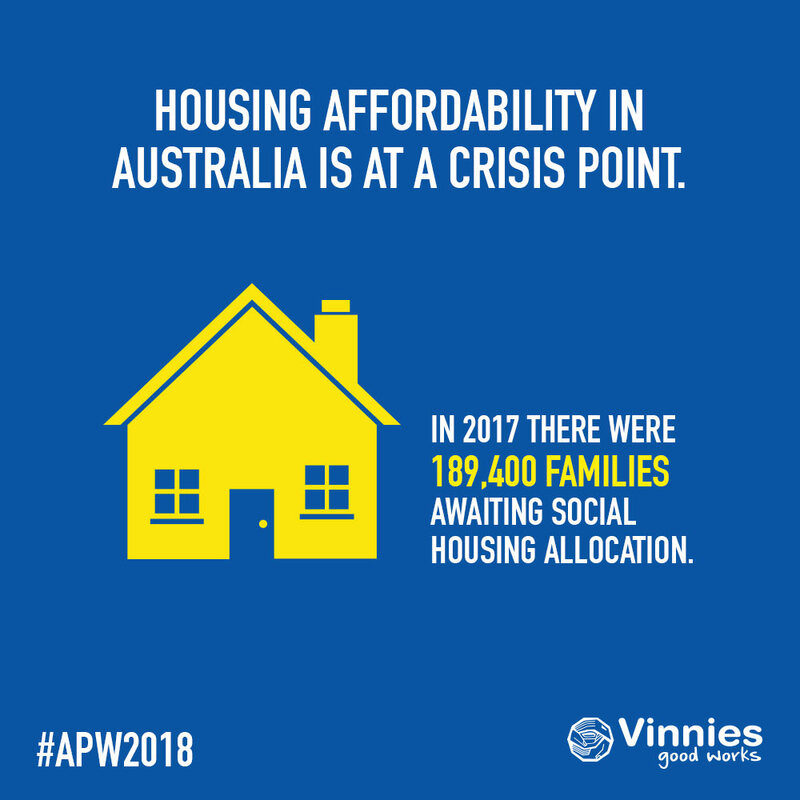 Read the submissions Vinnies has made to government to bring about change for people experiencing inequality and poverty. Visit the calendar of events on the Anti-Poverty Week website to see how you can get involved. 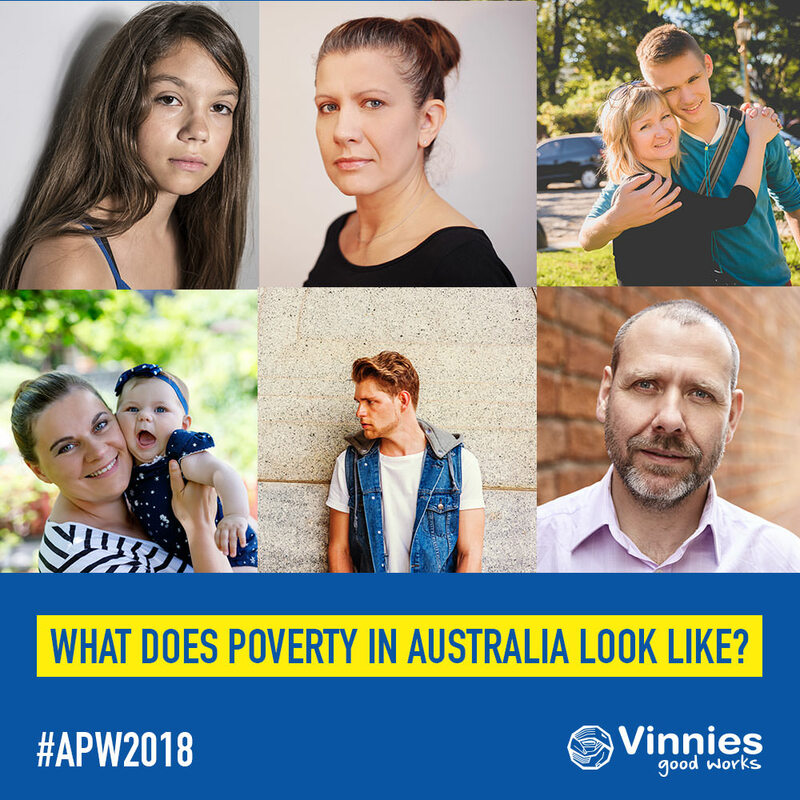 Use any of the social media tiles below to help promote Anti-Poverty Week and help us educate more Australians as to what poverty looks like in our country. 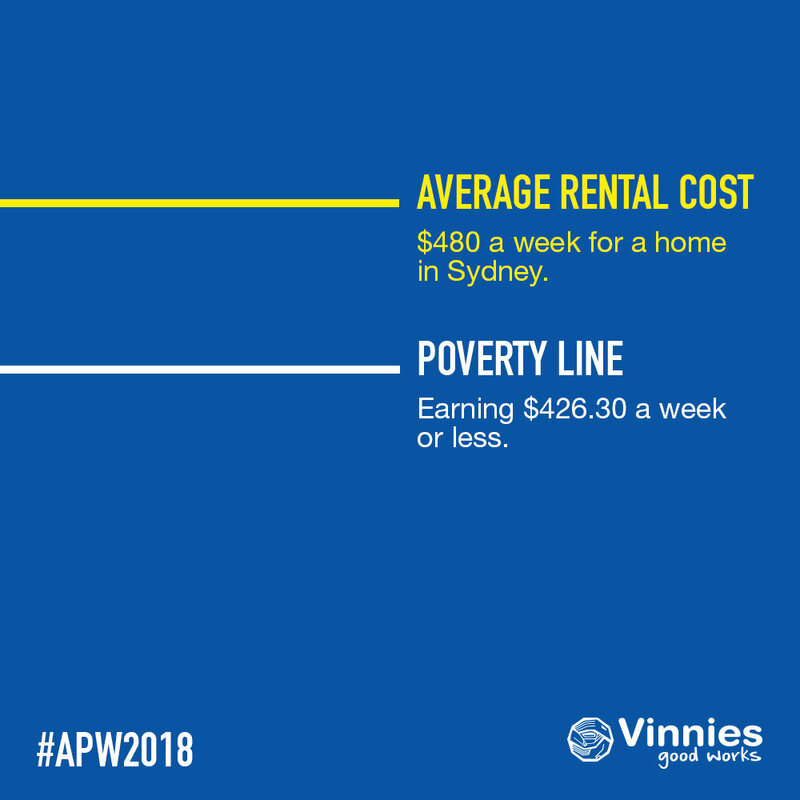 Don't forget to use #APW2018 so we can see your posts and follow us on Facebook , Twitter and LinkedIn . Vinnies has long campaigned for an increase in Newstart and Youth Allowance payments. We are calling for these payments to be raised so that people relying on them can meet their basic needs and live with dignity. Every day, our members and volunteers witness first-hand the poverty and hardship experienced by people on Newstart and related payments. Our social safety net should ensure people can afford a roof over their head and food on the table when they are unable to support themselves. Yet payments like Newstart are so low that many people cannot pay for essentials. Newstart has not increased in real terms in 24 years and has failed to keep up with the rising costs of living. It has fallen ever further below the poverty line and behind average wages. Today, over 800,000 people are struggling to live on as little as $39 per day. People locked out of paid work, carers, parents, and students are being forced to choose between eating a meal and paying the rent, or buying shoes for their children and maintaining their health. Using the hashtag #RaisetheRate , a diverse coalition of charities, community organisations, business groups and individuals with lived experienced of poverty are urging the Commonwealth Government to recognise its responsibility to provide adequate income support – so that Newstart and other income support payments are a true support, not a pathway to poverty.